The composition consist of five different shaped tiles that fit in many ways to each other like a puzzle. It's perfect to enrich both private and public spaces in indoors and outdoors. Each composition will be modified according to the space and need; shapes can be used less, with different amounts and their decoration and coloring can be affected. Each composition thus becomes a unique piece of its own. They can be stacked and produced also to meet their functional need as tiles like e.g. in bathrooms and kitchen backsplashes. Ryijy is Finnish meaning a traditional wall rug which is a decorative art form unique to Finland. Geometric shapes as well as floral and human figures were popular in the late 19th century. "Ryijy" -tiles are especially inspired and simplified from the geometrical shapes of the ryijy rugs. 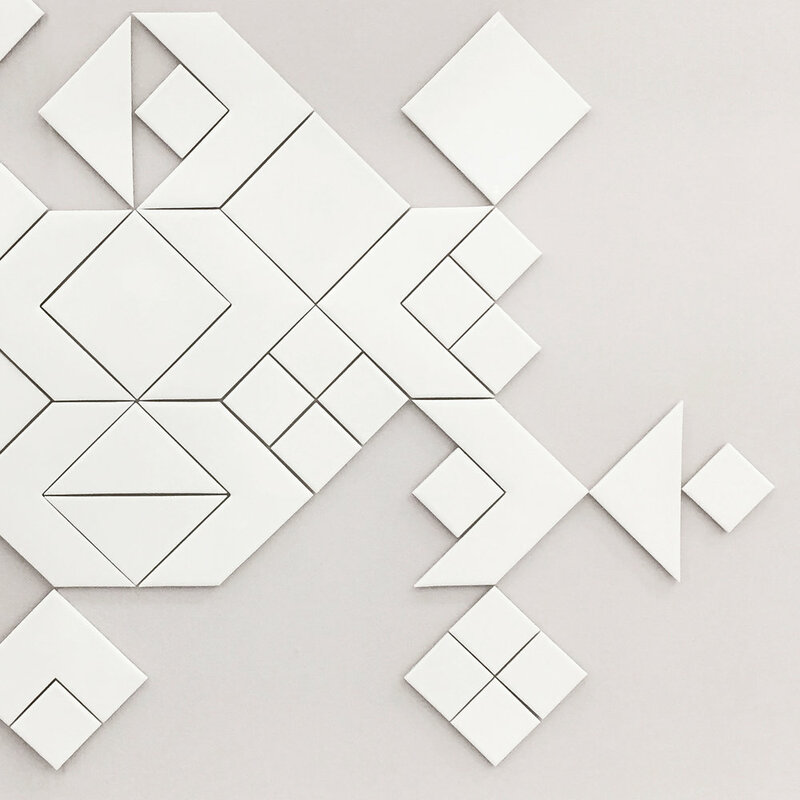 "Reminiscent of arrows, Laura Itkonen’s 'Ryijy' tiles offer plenty of room for creativity, perfect for those who enjoy customizing their walls. It consists of five models that fit together like a puzzle, allowing you to make a unique masterpiece for your space. All handmade in her studio, Laura’s 'Ryijy' tiles add the right amount of energy to plain walls." This piece of art is always custom-made and the price varies. This art piece can be customized like a module; size and the amount of different shapes as well as colouring. The whole can consist of a small number of pieces or it can be a whole-wall-sized work. The work can also be installed outdoors. Please contact me directly for indicative pricing and for more information. When purchased, the work can be attached either to a painted wood board (pre-attached) or even directly to the wall. When mounted directly on the wall, installation instructions and necessary mounting accessories are included.